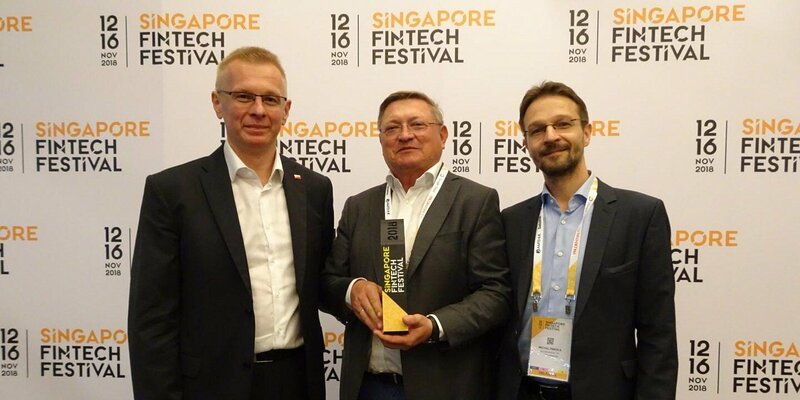 Billon, the company that has civilized blockchain, was announced a winner of the Global FinTech Hackcelerator during Singapore Fintech Festival - the largest FinTech festival in the world. The judging panel awarded Billon's zero-cost transaction DLT platform as a core element of inclusive financial solutions, with which financial institutions could capture new, unaddressed markets. The company received a cash prize of S$ 50.000 and will plan the actual adoption and integration of that platform into a real client context. Michał Pakuła, MD, Business Delivery & Financial Infrastructure at Billon, said "We are thrilled that our zero-cost transaction DLT platform was recognized with this fantastic award. By creating that solution Billon unleashed the power of blockchain, delivering all the benefits of distributed ledger technology without the cryptocoin downsides. We make micropayments possible, with transations of any value made in national currencies, instantly, and at no cost. " At the Global FinTech Hackcelerator Billon pitched its DLT platform as a tool for financial institutions willing to embrace the booming $3T market of micropayments. As today's banking systems do not work very well with small amounts of money, FIs need a new technology to open that market. Billon's payment platform allows banks to mint regulated e-money and offer payments of any value without suffering losses. The Global FinTech Hackcelerator program is ran by Monetary Authority of Singapore (MAS), together with KPMG Digital Village. Billon was shortlisted for the accelerator as one of 20 finalists from over 300 submissions from around the world. The company went through a 12-week acceleration program with the mentorship from HSBC Singapore. At Singapore FinTech Festival the finalists presented 5-minute final pitches in front of ~1000 audience, followed by 5-minute individual Q&A sessions. Mr Sopnendu Mohanty, Chief FinTech Officer, MAS, said “The Global FinTech Hackcelerator is a great platform for FinTechs not only to showcase but also to contextualise their innovative solutions for the industry. Many of the finalists from the past two years have gone on to receive funding and to contribute their solutions to the industry. We wish our third batch of winners similar success." Michał Pakuła added "My big thanks go to our engineers and all Billon employees for creating that solution, our clients and investors for being early adopters and believers, and last but not least to MAS, KPMG and HSBC for helping us introduce Billon’s civilised blockchain to ASEAN. " Two other companies was recognized alongside Billon. Mosabi empowers underserved populations in emerging markets with free phone-based e-learning linked to inclusion initiatives and the Sustainable Development Goals. BetterTradeOff provides financial planning and life planning platform, matchmaking clients with financial services providers. About BillonBillon was founded with the vision to civilize blockchain so that each business and their every customer can benefit from the improved security, cost, and user experience. The unique distributed ledger architecture relies on national currencies and stores money, documents and identity directly on-chain, fully protected by the power of blockchain. Billon works with clients through modular building blocks that already enabled solutions such as trusted document management, content monetisation and corporate motivation. Founded in 2012, Billon is an FCA registered eMoney institution with a global team across offices in the UK and Poland.About Singapore FinTech FestivalSingapore FinTech Festival (SFF) is the world’s largest FinTech festival and global platform for the FinTech community, drawing more than 30,000 participants last year which comprised of FinTech players, technopreneurs, policy makers, financial industry leaders, investors including private equity players and venture capitalists, and academics. The 2018 Festival will see participants from over 100 countries and host more than 250 global luminaries and 400 exhibitors, featuring highlights such as the FinTech Conference with a new AI in Finance Summit and Global Investors’ Summit, the FinTech Awards, Global FinTech Hackcelerator, Innovation Lab Crawl, Industry Networking and Workshops. The Festival is organised by the Monetary Authority of Singapore (MAS) in partnership with The Association of Banks in Singapore and in collaboration with SingEx Holdings. Festival Grand Sponsors include AMTD, Deloitte, GIC, Google Cloud and Prudential. Find out more at http://fintechfestival.sg.